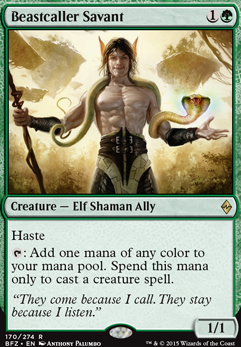 : Add one mana of any color to your mana pool.Spend this mana only to cast a creature spell. Ambuscade Shaman and Primal Forcemage : only works with hasty creatures. 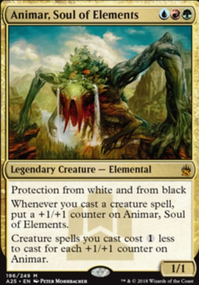 Anowon, the Ruin Sage : slow and introduces a different tribal theme- feels out of place, especially to vorthos weirdos like me. Can't have a vampire card in a shaman deck, man! 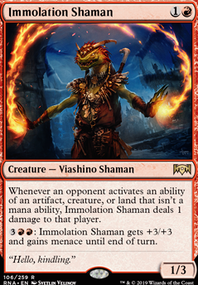 Beastcaller Savant , Bloodline Shaman , Shaman of Forgotten Ways , and more or less all of your planeswalkers: dependent on the number of creatures in your deck and even without the cut cards has a <50% chance to draw you a card. Dragon's Herald and Hellkite Overlord seems like an odd package. Fauna Shaman and Underrealm Lich : you have no reason to stock your graveyard and very few things that get things back from the graveyard. 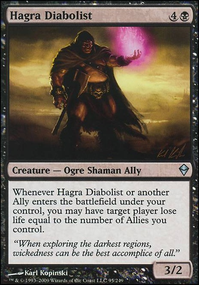 Mazirek, Kraul Death Priest - also Door of Destinies : so many people put him in aristocrat decks, it confuses me! Do you want your creatures to die or not?? Mindclaw Shaman : for you to get any real value out of him, you need to be casting an instant or sorcery that costs at least 4 mana. Decide depending on your meta whether that's consistently feasible. Stoneshaker Shaman : how much instant interaction is there in your meta? If the answer is less than ALL OF IT, this card is bad. Reach of Branches feels like bulk here. 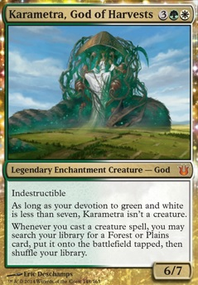 This card belongs in an Azusa, Lost but Seeking deck. Mxyzptlk on It's raining men, HALLELUJAH! Biggest thing you need to switch here is your ramp. Kodama's Reach type ramp and mana rocks are not the way to go here. 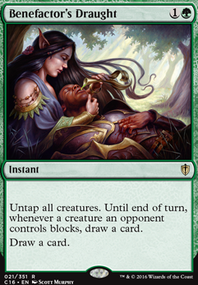 Replace them with cards like Sakura-Tribe Elder , Wood Elves , Beastcaller Savant , Birds of Paradise , Bloom Tender , Rattleclaw Mystic , Somberwald Sage , Shaman of Forgotten Ways , and/or Selvala, Heart of the Wilds . Next is card draw. Beast Whisperer , Soul of the Harvest , Primordial Sage , and Glimpse of Nature are really good draw effects here. 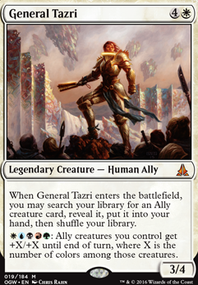 I'd also make room for Vizier of the Menagerie for his pseudo draw and mana fixing. I love Animar... it's a weird relationship. I have several suggestions for you and I'll try to break it down by category. I'd suggest dropping several of your non-creature spells to find room for similar abilities on legs. 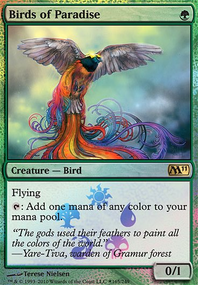 Card Draw: Primordial Sage , Tishana, Voice of Thunder , and Glimpse of Nature if it's in your budget. 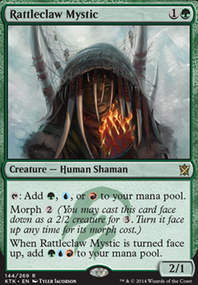 Ramp: Sakura-Tribe Elder , Somberwald Sage , Shaman of Forgotten Ways , and Rishkar, Peema Renegade . Beastcaller Savant also works like any morph/eldrazi for Cloudstone combos. Bloom Tender is amazing if you can afford one. Counter Doubling: Pir, Imaginative Rascal . Turn 2 Animar: Wild Cantor and Exploration . Haste Enablers: Ogre Battledriver and Urabrask the Hidden . Turns all your mana dorks into Cloudstone combo pieces and everything else into immediate threats.